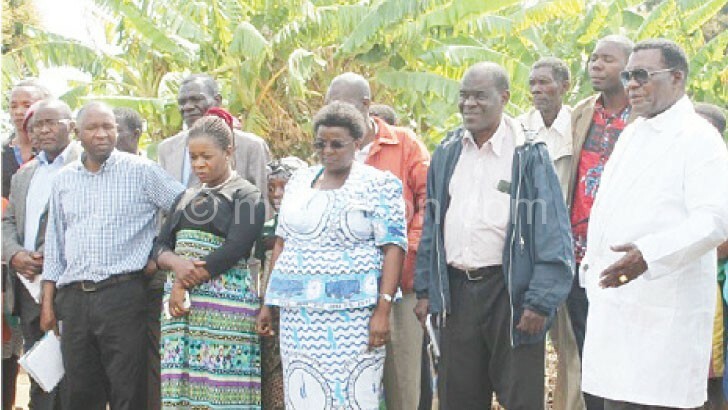 Minister of Agriculture, Irrigation and Water Development George Chaponda has hailed Farmers Union of Malawi (FUM) for supporting farmers under Ntchera Irrigation Scheme in Zomba using solar powered irrigation. Chaponda said this on Tuesday when he visited the scheme situated along the Shire River in Masaula Extension Planning Area (EPA), Traditional Authority Mulumbe (T/A) in the district. FUM, with financial support from the Department for International Development (DfID), has installed a solar powered irrigation system at the 55-hectare scheme to make irrigation process easier. The machine pumps water from the Shire River into a 50 000-litre storage tank which is later used to irrigate crops using channels. “I would like to commend Farmers Union for this irrigation initiative as it will complement government efforts in fighting hunger in this area which is mostly affected by drought,” said Chaponda. The irrigation system FUM installed is under its Agriculture Recovery Project being implemented in Zomba, Machinga and Dedza districts.